Debt ceiling fight: House Republicans can't blame Obama for everything. 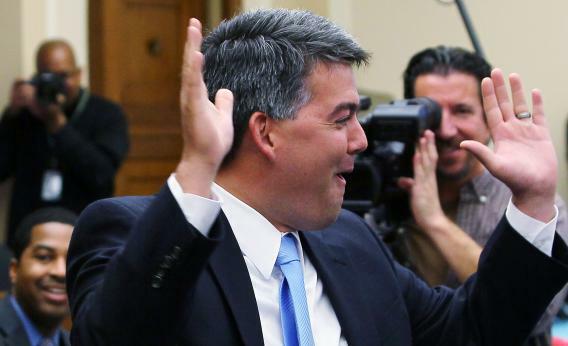 Republicans like Colorado Rep. Cory Gardner will once again bargain for budget cuts in exchange for a debt limit vote. Big Media captures an interview that Colorado Rep. Cory Gardner, one of the most accessible members of the 2010 House class, gave to local radio. Gardner’s asked about the debt limit, in the context that it’s coming up yet Washington can’t seem to do anything. Gardner just rolls with it. We’ve got to use this opportunity to reduce the size and scope of government, and how we can require opportunities to look for savings, look for cuts, and what we’re going to do to grow the economy through common sense tax reform. I think there’s great opportunities for us to get back on track. Here’s the paradox: Most of what Republicans do these days is geared toward proving they are the populist branch of the government, and that any obstruction is the fault of Democrats. That was the goal in the student loans battle—getting the public to blame Democrats for not taking a deal, not to blame Republicans for holding off on keeping current Stafford rates. That’s the goal later today with the Farm Bill. But after the summer ends, Congress is going to confront another debt limit increase. This increase has been delayed for a few months, because the tax hikes and automatic cuts put into law by previous Congresses have created a smaller deficit. Yet the party’s committed, again, to forcing a cuts-for-debt limit deal. How do they avoid looking like the aggressors? UPDATE: Hey, it’s not the worst plan: The Washington Post calls the pseudo-Farm Bill’s victory, by a 1-vote margin, a “victory” for Republicans.